Today, December 11, 2017, President Donald Trump and Vice President Mike Pence gave a joint speech on the signing of Space Policy Directive 1 to direct NASA to return astronauts to the Moon on the way to Mars and beyond. If this sounds familiar, Space Policy Directive 1 is the formal signing of a concept promoted by Vice President Pence during the inaugural reestablished National Space Council meeting on October 5, and rumored to be this Administration’s policy for months prior. Space Policy Directive 1 is also very similar to the space policies promoted by President George H. W. Bush in 1989 known as the Space Exploration Initiative and President George W. Bush in 2004 known as the Vision for Space Exploration. Despite the similarities in NASA human spaceflight direction between these three policies, the differences in motivations and emphases in the space policy speeches is striking. 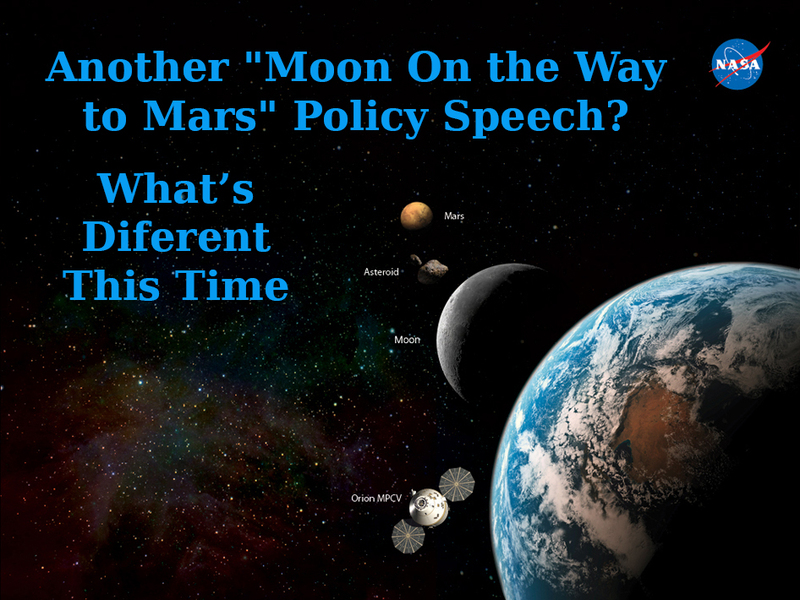 President George H. W. Bush’s speech on July 20, 1989 emphasized returning astronauts to the Moon “to go there and go on” to Mars to establish “permanent settlement of space” as a natural continuation of the Apollo program. The national pride that fueled Apollo was invoked to “establish the United States as the preeminent spacefaring nation.” Among other justifications for the program was an emphasis on Earth science research and to continue the legacy of astronauts who had given their lives explore space. President Donald Trump’s speech today continued this Administration’s theme of American leadership, emphasizing a desire for America's space program that “once again leads and inspires all of humanity.” Invoking America’s “pioneering spirit,” he called on NASA to “establish a foundation for an eventual mission to Mars. And perhaps, someday, to many worlds beyond.” He also mentioned military applications in space. American leadership and equivalent language was used 11 times in President Trump and Vice President Pence’s speech. In contrast, American leadership language was only used once in President George H. W. Bush’s speech (“It is America's destiny to lead.”) and not at all in President George W. Bush’s speech. National security and military applications were not mentioned in either Presidents Bush’s speeches. NASA is a civilian space agency. President Trump and Vice President Pence may have been influenced by Department of Defense input during the National Space Council meeting when invoking national security as a justification for an American human mission to return to the Moon. Jobs or economic benefits were not mentioned in either Presidents Bush’s speeches. Although creating jobs may have been a reason to promote a large government program and certainly has been a reason for Congressional support, it was not outright stated as a reason to direct NASA to send astronauts to the Moon and beyond. Vice President Pence’s justification of job creation, echoed by President Trump after the speech, may have been to encourage Congressional support or to continue a theme of the greater Trump Administration. Lacking in President Trump and Vice President Pence’s speech were details regarding mission planning and architecture, space vehicles, dates, and budget requirements to request from Congress. It is likely these details have not yet been determined. Until those detailed are worked out, it is difficult for Space Policy Directive 1 to move forward.